A ball over the top, a blur of speed and a strike of such exquisite refinement to leave Tochukwu Oluehi befuddled at her near post and Thembi Chrestinah Kgatlana etched her name indelibly into the consciousness of Nigerians. That goal scored in the 85th minute and nominated for goal of the year at the 2019 CAF Awards was the difference as Banyana Banyana secured a first victory in nine attempts over the Super Falcons at the 2018 Women Africa Cup of Nations in Ghana. The Falcons may have won the trophy for a record ninth time triumphing over Banyana Banyana via penalties in the final and Francisca Ordega may have been voted Final Woman of the Match with Asisat Oshoala registering the only hat-trick at the tournament, but the 2018 AWCON undoubtedly belonged to the talismanic Kgatlana. The 22-year-old Houston Dash of Texas forward was voted Woman of the Match in three of her five matches at the tournament and scored in four of five matches only failing to net against Nigeria in the final. Her five goals were the most by any player earning her the Top Scorer gong and she also performed the remarkable feat of scoring against every team she faced (she did not score in the final against Nigeria but scored against them in the opening game of Group B to add to strikes against Zambia, Equatorial Guinea, and Mali) and also had two assists to her name. No single player was as influential as the South African at the 2018 AWCON as she led Banyana Banyana to second place and a place at the 2019 FIFA Women’s World Cup for the first time in their history. It didn’t come as a surprise therefore that she was the overwhelming choice of the Technical Study Group (TSG) of the tournament for the Total Woman of the Competition awarded to the Best Player of the AWCON. Riding on the crest of her stunning performances at the 2018 AWCON, Kgatlana expectedly has been nominated for the CAF Women’s Player of the Year Award and hopes to become just the second South African woman to be named African Player of the Year after Noko Alice Matlou’s triumph in 2008. But to achieve that she will have to overcome competition from the Nigerian duo of Francisca Ordega, a first-time nominee and reigning Player of the Year Asisat Oshoala. It is a formidable field with the 24-year-old Oshoala, scorer of ten goals as her Chinese side Dalian claimed the Chinese top flight title expected to provide stiff competition when the awards are announced in Dakar, the Senegalese capital. 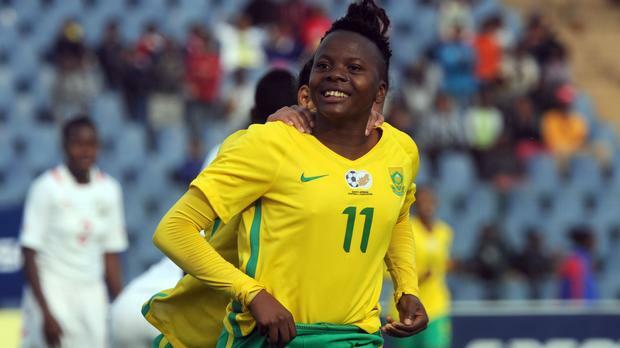 But Kgatlana who has been nominated for a second straight year believes that her performances for South Africa at the 2018 Women’s Africa Cup of Nations (AWCON) gives her “a great chance” of being named Africa’s best female player for 2018. “I stand a great chance to win the Best Player Award after I had a marvelous African Women Cup of Nations (AWCON),” Kgatlana told busybuddiesng.com exclusively. Whatever happens in the Senegalese capital, history is sure to be made when the winner is finally revealed. Reigning Player of the Year Oshoala would hope to become the first woman since the inception of the Award in 2001 to win on three consecutive occasions and in the process equal the legendary Perpetua Nkwocha’s haul of four Player of the Year Awards. No player has ever won three on the bounce with only Nkwocha twice (2004, 2005 and 2010, 2011) and Nigeria’s Cynthia Uwak in 2006 and 2007 the only other players to have won the award on consecutive occasions alongside Oshoala in 2016 and 2017. 25-year-old Ordega who plays in the United States for Washington Spirit had an excellent AWCON and has a strong claim to be considered Nigeria’s best player at the tournament where she bagged a brace of goals and Woman of the Match awards but is considered an outsider for the award. After finishing runner up behind Oshoala last time out, Kgatlana says winning this time around will be transformative for Women football in South Africa. “Winning [the Player of the Year award] would mean a lot to me and it would change the face of South Africa’s Women football as a whole,” she told busybuddiesng.com. While she has become totemic for Banyana Banyana, Kgatlana says the impact of national team coach Desiree Ellis and her teammates have been fundamental in her growth and all that she has been able to achieve so far. It is now left to be seen if her strengths will be enough for her to be named Player of the Year for 2018.